The In-Eko Screw Press is manufactured of 304 Stainless Steel and is a beneficial accessory to the Mechanical Bar Screen. Generally placed below the outfall of the head of the bar screen, the screw press will dewater and compact the screened material. The pressed screenings then travel out the chute into the receptacle of your choice, and the smaller volume of waste results in longer storage capability before having to remove the waste. The water pressed out returns to the channel to go to downstream processes. The In-Eko Screw Conveyor is also manufactured of 304 Stainless Steel and is available in a variety of lengths up to 39 feet. Also used most often in conjunction with the Mechanical Bar Screen, the Screw Conveyor is suited for applications where the desired waste receptacle is located far away from the outfall of the head of the screen. 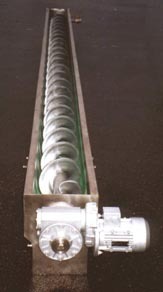 The Screw Conveyor uses a shaftless screw and can be manufactured for a variety of inclines. 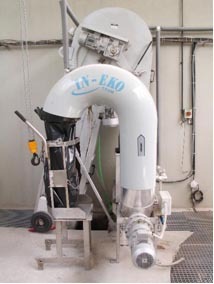 If desired, the In-Eko Screw Press can be installed below the outfall of the Screw Conveyor. The In-Eko Stainless Steel Sluice Gate is available in a variety of sizes to be installed into concrete. Whether restricting flow through a concrete channel or being used to shut off sections of a modular designed wastewater treatment plant, the Stainless Steel Sluice Gate is a cost-effective solution. The Sluice Gate is available with a manual operating wheel or with an electric drive. 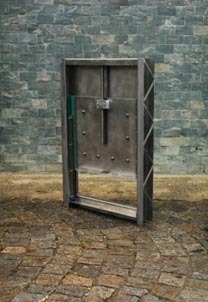 The Gate can also be equipped with an extended shaft for deep thru-wall installations.